A promising debut from a young band of Italic Pagan Black Metal...These are the answers by Janicot and Necurat gathered in a period of 2 sessions after the release of "De Rervm Natvra"
Necurat: We started in 2000 trying to render the dark atmospheres of a deeply occult matrix in an innovating manner, even though our attitude has slightly shifted to basically philosphical topics and a riper music style. The excellent recording, mastering and all the rest was made by Gabri. Tell us about that experience and what he's like. Janicot: Gabri, the owner of the Fear Studios and main sound technician, allowed us to work in a very professional and relaxing environment at the same time; experienced people who gave us the best advice and supported us during our more stressing moments. There's no doubt, if you wish to achieve a satisfying result, you need to apply to prepared technicians like him. Your CD includes songs written in a long while; why did you decide to release them all together and are there any songs left out as they weren't suitable for this concept? Janicot: There was no mindful order during the making of "De Rervm Natvra"; we followed our instinct and artistic taste for sure. For example when we recorded the first parts in autumn and winter 2003 we were kind of unexperienced in certain respects and a few songs of that time aren't representative any longer. Some, as you rightly guessed, were excluded during the 2 recording phases. Somehow we had no choice but release a CD with compositions created in different periods of our career; it wouldn't have been a good idea to split them in 2 different records. Necurat: It was vital to omit a few songs; we're so awfully prolific that it becomes hard to deal with all of our stuff. I like to view our debut as the link between our past and current attitude. As to the concept, what do your songs deal with? And what is the concept behind "De Rerum Natura" Give us more explanations. Janicot: Sigma Draconis' concept is deadly vast and changes in every record. For instance in our demo "Necromantic Art" we borrowed Lovecraft's themes by adopting his mithology (Azathoth, Chtulhu) in a nihilistic and anti-human way. Our monicker itself indicates a celestial constellation deriving from an important element of nordic mythology, the dragon, and also deals with stars; as a matter of fact, the stars we can see are light refractions of bodies died centuries ago; we simply see their light travelling 300,000 Kms a second, which is still possible to see; therefore our planet seen at such a distance would show its life in the neolithic era. This also shows that we, pathetic human beings, are a mere shadow, an illusion. "De Rervm..." is far less nihilistic, even if it maybe proposes a less elaborated view. The experiences had between these 2 periods made our opinions change and become indipendent from Scandinavian themes. We got closer to an abstract spiritualism and felt closer to our origins thanks to the journeys abroad. What's still connected to the past is denial of a superior entity imposed by years of a fascinating, yet bitter history. We increased our pagan concepts too. That's the prologue to our debut, whose title refers to an ancient Latin text where we found a part of our present ideas. Lucretius' "De Rervm Natvra" was conceived as the book of salvation mainly against religion and thought shallowness; we just added a further elitaire and anti-human meaning; salvation doesn't belong to all humans, only very few deserve it while most are doomed to an abstract holocaust, a word which mustn't be confused with the historical event. The theme of war is deeply rooted in our ideology, our war is a condemnation of modern society and its hypocrisy; the war topic has slightly grown in us taking place to the Pagan ones. What once was the Christian invasion for the Norses is for us invasion of ignorance and denial of freedom we mainly see in Islam. Essential is the union that makes us proud between classic and barbarian world, simply joined by Paganism. As a matter of fact we've never claimed to belong to nordic or Scandinavian worlds, as we're not physically a part of them, but we're connected to those barbarian tribes placed north of Italy (the tribe once living in this area was known as 'Gallic Boi' and named our city Bononia); that's why we feel akin to this neo-pagan faith, which has inherited ancient nordic traditions, that we've pooled the teaching of a wholly animistic Latin text. Necurat: I really have too much to say about this. Let me just add that we're not a concept band, since we occupy ourselves with 360° topics. Every song of ours is a separated creation, so I'd like the listener to pay attention on the relation between lyrics and music. We spent too many nights reflecting what we really are and Janicot's words are a proficient recapitulation..
What do you answer those who say it's wrong, unfit to have your views, seeing that Black metal itself originates from metal, which in turn derives from rock and that from jazz, that was a music played by niggers (or 'Coloured people' as the ruling hypocrite way likes to call them) only in the beginning? Necurat: For those who ignore it, the guitar was invented by the Arabs. It's not important what you musically relate to or who your artistic ancestors are. What matters is to leave a real sign in your epoch. We're nothing but sons of our era even if we love to remember the glory of our past; it's a simple reinterpretation. Musical harmony is something so divine and great that I find such a topic tremendously superficial. I heard Golgotha left the band soon after the recording. What happened and is the line up steady now? We won't answer this question, as she herself wouldn't like to talk about that without being involved. It's something strictly personal and connected with the band's policy. So far the line's up's stable. Our latest entry was Uller and we're very satisfied with him. Anyhow, Golgotha is a greatly clever artist and she's working on her solist material that'll make her proud. Have you kept all of her keyboards parts or were some eliminated during the recording? Janicot: Why should we've done that? All of her parts were kept on the CD, while live the songs differ, as we've rearranged them. The Cd was recorded as it was conceived and we're proud of her work. As stated in my review, only "Visions..." doesn't satisfy me completely. What's your opinion about that and the rest? Would you change something? Necurat: They're definitely sonorities not belonging to us anymore; it's actually an atypical song for us, but it'll always have a place in my heart, as it was a vent during a devastating part of my life. Even if we feel it far, we're proud to have it in our repertoire. As to the rest, every time you record you'd like to have a different result and would like to restart from the beginning, but they're often futile perfectionisms one had better avoid. Why is the last song in Italian? Janicot: Mainly cos we're connected to our roots. English is a poetical and universal language, Italian is ours! No other language can be more poetic and important for us. Support Italic Black metal! Necurat: As you've certainly noticed, it's an ambient outro, nevertheless it's a sheer song that makes the listener feel in our dimension, inside Sigma Draconis' essence. Could something so deep and personal be expressed in a language that isn't yours? We heard you're playing in all Italy but not so much. What're the main difficulties for a young Italian Black metal band to play? Necurat: The strength of a genre so rife with hatred and violence also comes from here. Try to imagine and put all your energies, passion and money into a project you know that will have to talk hearts of people really believing in that, and suddenly realize one day that it's just a swarming mass of frustrated teen-agers judging you without even knowing you. I'll tell you: I've never loved children, I play for the few adults wrecking in this faeces sea. You have all of my support as much as I have for you. It's hard to organise a show since the club owners are poor too, so they prefer to take interest in more remunerating topics, and they often leave us with empty hands. That's connected to ignorance. To censor a band dealing with phylosophical and not political themes is a vile and loser's mentality. Had they been convinced of their pitiful views, they wouldn't have feared us. In the beginning we got rather disappointed, now we don't think of it anymore. If we took all suckers seriously, we'd've gone nuts long ago! When you play live, do you just play your songs faster and harder or do you also rearrange something, like for example the keyboards parts? Necurat: We exclusively think about creating a set list mirroring an artistic line, and, yes, we've rearranged some parts in order to replace the loss of the keyboards in our gigs, but we only try to play a repertoire ranging from our origins to our recent material uniformly. On stage we wanna propose every single shade of Sigma Draconis and not concentrating only on our latest releases. Necurat: I saw them only once years ago; a most good band, with a bit cold impact live but after all they made a cool show. Janicot: I happened to see them live by chance as I was with my woman in Sicily at that time. The venue and the equipment didn't allow them a great performance. I thought they'd've been more professional and farther from the audience, whereas I witnessed a true underground spectacle. Now that you've reminded me, I wish to emphasize the big difference of organization and especially public between north and south of Italy. Actually I can't say which is better! Necurat: Well, you catch me unawares...Someone tried to break open our rehearsal room, so we angrily waited for the wretched thieves to come back in the next nights; we slept camping among our instruments and equipment in the dark to welcome them the way they deserved, but no-one came. Those nights turned out to be a hell of a raving period of ansurd thoughts! What Italian bands do you esteem and feel like recommending us? 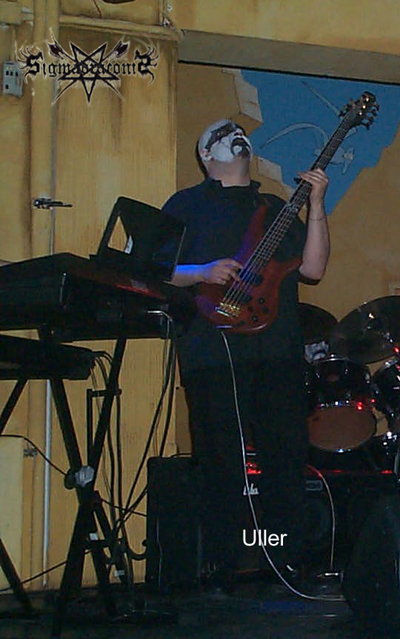 Necurat: Fearbringer, a real good friend and a talented musician, Death Dies (excellent career and extraordinary evolution), Noctifer (exaggerated impact and masterly style). Lemme stress out I support all of Italian underground and I'd like to see it triumph one day. Janicot: Fearbringer, a person you very easily work with and an awfully good friend; Noctifer, Sakahiter, Throne of Decadence, Exsecratum, Der Tod, Necrodeath. I deeply esteem Abgott's Agamoth as well. Do you have time to answer all your world's fans? Janicot: You must know we have so few that I have shitloads of time to do a bunch of other stuff! Necurat: I always like to hear sincere appreciations about us from a small number of die-hard fans. What're your next plans with Sigma Draconis and releases from your own label and distro, Nocturnal Brights productions? 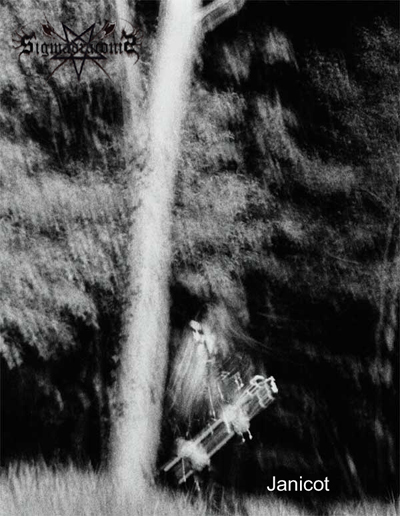 Janicot/Necurat: Soon we'll release a limited repress of our 1st demo tape, remastered and including an updated artwork. Of course we're promoting "De Rervm Natvra" live throughout Italy, and we're massively sending our promoCDs abroad too to tons of webzines, fanzines, magazines, labels and radios. Besides we have a good deal of new songs and we're deciding what to do with that; they might even come out as a 7" amongst 4 bands! Questions are over; just add all I didn't ask you for the people reading your words. 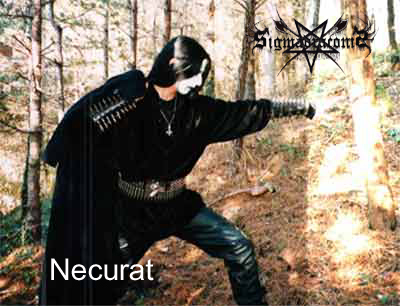 Necurat: Don't get close to the world of Black metal shallowly, and support underground! Heil Victory!